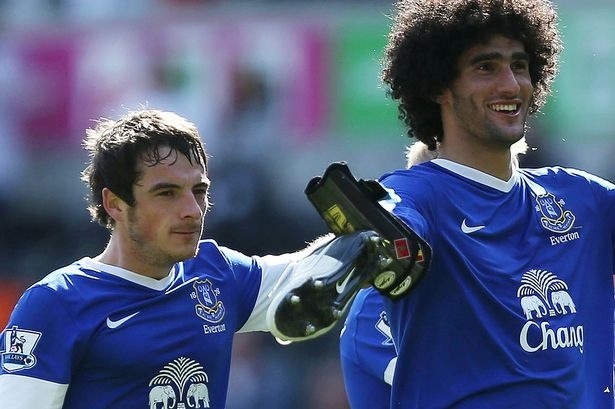 The Liverpool Echo have today reported that Everton were in receipt of a derisory double offer for star players Leighton Baines and Marouane Fellaini, just hours before the Premier League campaign kicked off on Saturday. The bid, which valued Baines at £12 million and Fellaini at £16 million was instantly rejected by the Blues hierarchy, with the figures involved angering everyone associated with the club and unfortunately will further damage the relationship between former manager Moyes and the Evertonians. For a start, Manchester United’s valuation of the two players appears to be significantly below their true worth. Everton have already rejected an offer of £12 million for Baines and were informed at the time that United would not return with a further bid. Now established as the League’s premier left back, the bid is both insulting and unwelcome. A price of £16 million for the influential Fellaini adds further salt to the wound. The Belgium had a release fee inserted in his contract at £23.5 million and even though that has expired the Blues will not sell for a penny less and in all likelihood will look to secure an even greater return if he is to move on. The offer and in particular the timing of the bid would suggest that Manchester United are trying to unsettle the two players, forcing Everton into a transfer against the wishes of the club. Pleasingly it did not appear to adversely affect the performance of the two against Norwich, both are excellent professionals and both have a genuine affection for Everton Football Club. The manager and the board have stated throughout the summer that there is no need to sell and it must be hoped at this stage that remains to be true. David Moyes’ involvement in the transfer will cause uproar amongst the supporters who held him in such high esteem and remained loyal to him even after he made the move to United. Moyes spent 11 years protesting against the lack of respect wealthier clubs showed to their financially poorer relations, but unfortunately he appears to have instantly forgotten his routes and shown little if no regard for his former club. Moyes himself turned down an offer of £12 for Baines just 12 months ago and paid a total package of £18 million for Fellaini in 2008. Both players have grown significantly from those moments in time, as has the overall value of the football transfer market. Privately, Bill Kenwright must be seething. David Moyes is a good and loyal friend of the Everton majority shareholder, but this underhand approach will be hard for the Theatre impresario to comprehend. The pair worked hand in hand for over a decade and were both passionate in their destain for Manchester City, when a similarly derisory offer unsettled Joleon Lescott and forced the Blues into selling a prised asset. Hopefully the board will remain strong and the players, who both need a strong domestic season ahead of next summers World Cup, believe their international prospects are best served with regular first team football at Goodison Park. Let us know your views on the latest transfer offer. Would you sell? Has your view of Moyes changed following this insulting offer? Next Post At what price would you sell? David moyes has turned into a fool. I wished him good luck when he left. Now I hope he fails and gets fired. That offer is an insult to the players he’s trying to buy and the club he served. We won’t sell but Fellaini has got to be worth £30 and Baines an easy £25. Dave you idiot, you’re at Manu now, they’ve got money. No chance we’ll sell to them now. Surely when you make a bid you hope it will be accepted. That never had a chance.